Background: Endscopic mucosal resection (EMR) has been accepted as a treatment of early gastric cancer (EGC). The number of EMR procedures for EGC has been increasing because a patient’s quality of life after EMR is superior to that after surgical gastrectomy. The recently developed EMR procedure, endoscopic submucosal dissection (ESD), makes en-bloc resection possible for mucosal cancer regardless of the size of cancer. In addition, this procedure enable to resect in one piece, therefore accurate pathology can be diagnosed. In Japan, although the number of patients with EGC treated by ESD has increased, the appropriate strategy for treating those with non-curative resection has not been established. 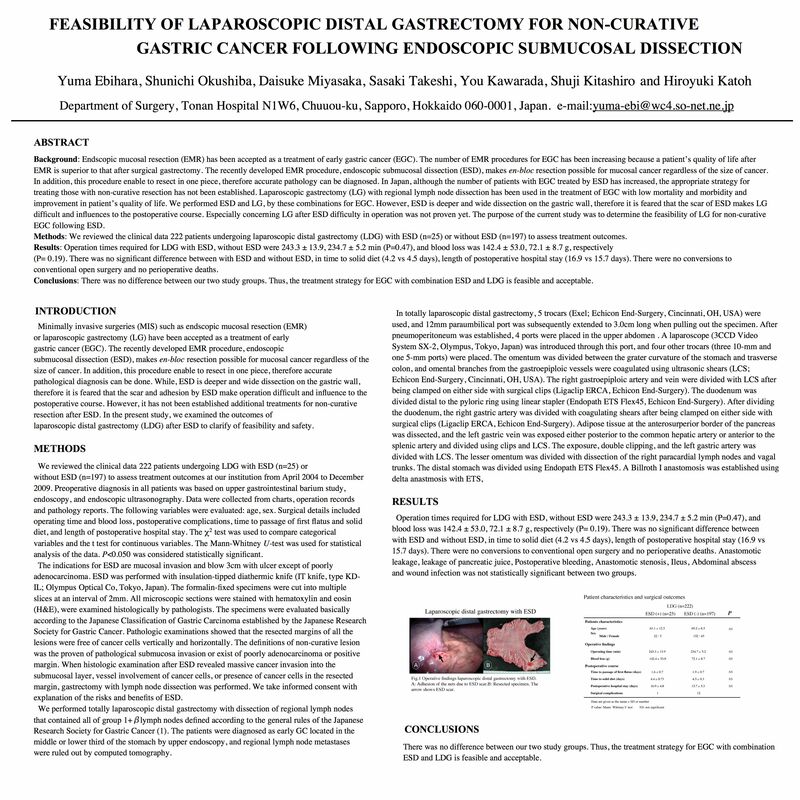 Laparoscopic gastrectomy (LG) with regional lymph node dissection has been used in the treatment of EGC with low mortality and morbidity and improvement in patient’s quality of life. We performed ESD and LG, by these combinations for EGC. However, ESD is deeper and wide dissection on the gastric wall, therefore it is feared that the scar of ESD makes LG difficult and influences to the postoperative course. Especially concerning LG after ESD difficulty in operation was not proven yet. The purpose of the current study was to determine the feasibility of LG for non-curative EGC following ESD. Methods: We reviewed the clinical data 222 patients undergoing laparoscopic distal gastrectomy (LDG) with ESD (n=25) or without ESD (n=197) to assess treatment outcomes. Results: Operation times required for LDG with ESD, without ESD were 243.3 ± 13.9, 234.7 ± 5.2 min (P=0.47), and blood loss was 142.4 ± 53.0, 72.1 ± 8.7 g, respectively (P= 0.19). There was no significant difference between with ESD and without ESD, in time to solid diet (4.2 vs 4.5 days), length of postoperative hospital stay (16.9 vs 15.7 days). There were no conversions to conventional open surgery and no perioperative deaths. Conclusions: There was no difference between our two study groups. Thus, the treatment strategy for EGC with combination ESD and LG is feasible and acceptable.